J-Go LEARN Inc. is an educational resource company founded by Jim Gomes (2014), whose express goal is to create educational products that will maximize both teacher effectiveness and student learning. 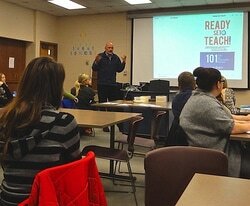 Our first offering--Ready-Set-Teach! 101Tips for Classroom Success by Jim Gomes—is endorsed on the front cover by school discipline consultant and five-time international bestselling author BARBARA COLOROSO. It's quite common for teachers to feel unprepared for the demands of the classroom. Ready-Set-Teach! is a simple, practical, and powerful classroom management plan—designed to meet this need. This guide will leave you inspired, motivated, and confident to take on the many challenges that you face as a teacher every day. Jim's road map to success will help you find what you are looking for—happiness and fulfillment in your teaching career. Released in Dec. 2014, Ready-Set-Teach! is available in paperback at these fine retailers (Amazon, Barnes and Noble, and FriesenPress) and on all major ebook platforms (kindle, nook, iTunes, Google books, kobo). At J-Go LEARN we are committed to providing creative and effective educational materials for teachers and their students. Currently, Jim is working on the publication of two decks of math cards for intermediate level students (grades 7-10). Jim's motto for teachers: "Have fun every day!"